I’m a few days late on this story, but it looks like the venerable Anchor Brewing Company of San Francisco has been sold after 45 years under the stewardship of Fritz Maytag (he of washing machine fame). Anchor is a legend in the brewing industry. 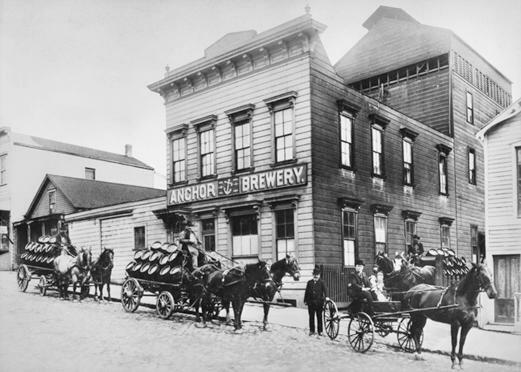 The original brewery opened during the California Gold Rush and was renamed Anchor in 1896 when purchased by Ernst F. Baruth and his son-in-law Otto Schinkel, Jr.* Yeah, I know…this is all on Wikipedia, but I felt like a brief history lesson was in order…more for myself than our readers. It’s one thing to call Anchor a “legendary” brewery, but it would be nice if I actually had my dates and facts straight. *I’m hopeful that my father-in-law will read this post and think to himself, “Perhaps I should buy MY son-in-law a brewery!” I suspect that will not be the case. Anyway, Anchor chugged along unremarkably for decades (although it did manage to survive Prohibition…no mean feat). In the late 50’s, mass-produced American light lagers began dominating the US beer industry and Anchor suffered. By the mid-60’s, Anchor was about ready to shutter its doors. Enter Fritz Maytag. Using his own fortune, Maytag turned the brewery around, and by 1971 Anchor had begun pumping out its flagship Steam beer. Anchor Steam became a favorite amongst beer drinkers looking for something better than the ubiquitous swill that was glutting the marketplace. In the 80’s, when craft brewers like Jim Koch and Pete Slosberg were just getting off the ground, Anchor had already been brewing their award-winning beers for decades. In a very real sense, Anchor was the first modern, American microbrewery. As the craft brew revolution exploded in the late-80’s, demand for Anchor grew. Today, you can get their fine beers in every corner of the country and their Steam beer is considered a true, American classic. So you can imagine my hesitation when I read about Anchor’s sale last week. Admittedly, the purchasers are saying all the right things about “building on” Anchor’s success so that they can pass it “on to the next generation”. I hope that’s the case. I sincerely do. My concern is that the purchasers are the marketing minds behind the Skyy Vodka brand…which is a well-marketed, but ultimately pretty lousy vodka. While I certainly don’t hold this against them, the fact remains that they made their bones by cleverly branding an inferior product. Now that they have a legitimately good brewery in their portfolio, I hope they don’t sacrifice quality in the name of the bottom line. If Anchor suffers under their management, the American craft brewing scene will be poorer for it. Posted in Ale Factories, Brews in the News.Tagged Anchor, Steam Beer.